TOWN Hall chiefs want to insure a Banksy stencil printed on the side of their headquarters in King’s Cross amid fears that it could somehow be stolen. Newly released documents show the level of concern among council staff over how they should protect the Argyle Road picture of a rat holding an exclamation mark. Some officials are worried that the stencil is fading, while others have suggested that it should be framed and accompanied with a plaque, legitimising it as public art. Graffiti on Camden Council’s headquarters would normally be washed away by its team of grime-busters but Banksy’s work has been given a different treatment, with a protective Perspex panel covering the rat. A series of emails which pinged around the Town Hall late last year show Lib Dem deputy leader Councillor Janet Grauberg sent out orders to protect the stencil or risk “getting into trouble”. The council water­blast­ed the building last year but demanded a hand-clean around the stencil to ensure it was not damaged. The emails were released to the New Journal under the Freedom of Information Act. 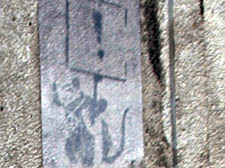 Banksy stencils can also be seen in Chalk Farm Road, Chalk Farm, and Newport Street, Bloomsbury. His work has sold for millions at auction.